Volvo Car Corporation is introducing an all-new four-cylinder 2-litre GTDi (Gasoline Turbocharged Direct Injection) engine in the Volvo S80, V70 and XC60, offering great performance and efficiency all in one. New Volvo-developed turbocharging technology, direct injection and twin variable camshafts give a unique combination of low fuel consumption, low emissions and high performance across a wide rev range - all in a particularly compact format. 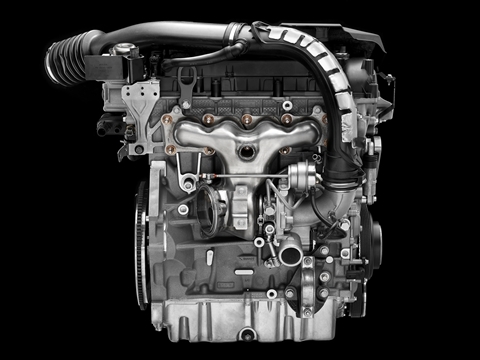 The new petrol engine, the 2.0 GTDi, produces no less than 203 hp despite its compact size and cylinder capacity. It pumps out 300 Nm of torque already from 1750 rpm thus securing a refined driving experience. "We've succeeded in making a four-cylinder engine that is as powerful as a 2.5-litre five-cylinder unit, and it's also much more energy-efficient. This is a very welcome both for those customers who want high performance as well as supreme driveability and for the environment that benefits from the improved fuel efficiency. One of the most important reasons behind the results is our new, patented turbo system that has been tailor-made for smaller energy-efficient engines," says Magnus Jonsson, head of Product Development at Volvo Cars. This innovative technology has made it possible to shape the exhaust ducts optimally to allow an optimal gas flow and generate the maximum pulse effect for the highest possible turbine efficiency. The pulse dynamics can thus be utilised to the limits in order to generate a high power output level across a wider range of engine revs. This translates into close to immediate response and good acceleration at both low and high speeds. "High performance is important to many customers. However, being an innovative and highly efficient powertrain, there is also a significant gain in both fuel consumption and emissions with this technology" says Magnus Jonsson. "A Volvo S80 with this engine and automatic transmission consumes just 8.3 litres of fuel per 100 kilometres." 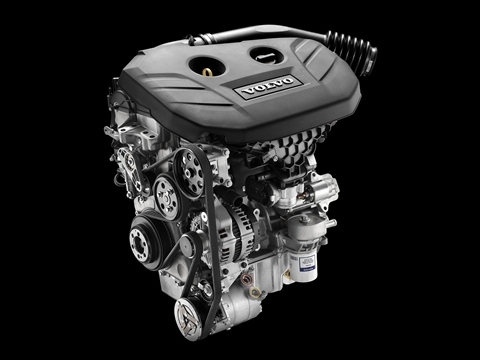 The new engine features direct injection. The injectors have seven holes for precisely controlled injection into each cylinder. The injectors are side-mounted. Direct injection gives a high fill rate in the combustion chamber, efficient combustion and low emissions. Thanks to this high fill rate, the turbo also starts spinning earlier, delivering alert response from low revs. This in turn results in swift acceleration and good driveability even from low speeds. Direct injection also contributes to quick and stable combustion at high loads, and thus smooth engine operation even when the accelerator is floored. The injection system is supplied by Bosch. The engine will be offered in combination with Volvo's automatic six-speed Powershift transmission or a six-speed manual gearbox. This new six-speed double-clutch automatic transmission combines the efficiency and driving dynamics of a manual transmission with the ease of a quality automatic transmission. The clutch activations are co-ordinated so that no torque interruption occurs during gear changing. This provides both the ease and permanent motion of a conventional automatic transmission and the performance of a manual transmission.